Are you sticking to your Gripfill gun – or is it sticking to you? It seems to me that Twitter is one ginormous cocktail party, where sadly you have to get your own drinks and canapés but where amazingly you can wear your jim jams and it doesn’t even matter. When I started tweeting to advertise my book, I was scared stiff and didn’t dare press any keys on my computer in case I tweeted something by mistake, or inadvertently insulted someone – because as any Twitter user knows, etiquette is all important (little finger in the air as the author sips Chardonnay). Sometimes the thought of doing a thing is daunting. I’m sure Jeremy would have (had he thought about it) been daunted at the fallout of his actions. As a punishment I think he ought to be made to clean cars in Sainsburys car park for at least 6 months – a fitting community service and you never know, he might even lose his jeans overhang. Daunting or not, building your own house will be worth it, and there will always be someone you can tweet who might be able to help you. Take it from me; never employ builders who don’t speak any English, unless you can speak their language of course. 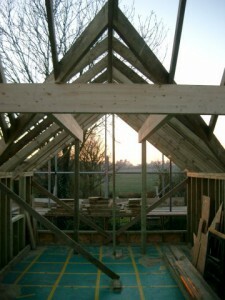 Think your build costs through – it is most important especially if you have a tight budget. Buildstore can help you with their build costs calculator. If your carpenter ends up taking the p** and asks you for some very expensive fixings that aren’t in the budget, just say ‘no – use some bl**** nails’ and stick to your guns, (hopefully not to your Gripfill gun, even though I expect you will find that it will come in very handy – Gripfill being the stickiest and toughest substance on earth). Talking of tweeting, my mum has a clock that chirps with a different sort of bird on each hour. The other day she went outside and heard a blackbird – strange she thought, it can’t be eight o’clock yet. I told her it’s the Pavlov’s dog effect. She has been conditioned by her clock! – now that could be a military strategy, if you have read The Men Who Stare At Goats by Jon Ronson you’ll know what I mean. 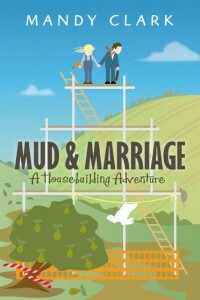 If you want more advice about do’s and don’ts on a self-build, you’ll find them in my book Mud & Marriage – A Housebuilding Adventure, available to buy from Amazon.co.uk (Kindle version now available) or from this website. And on that bombshell … What an adventure it was! This entry was posted in Self-Build, Uncategorised and tagged Bird clock, build cost calculator, Buildstore, Gripfill, Jeremy Clarkson, Jon Ronson, Sainsburys, self-build, The Men Who Stare At Goats, Twitter on 12th March 2015 by Mandy Clark. You can ‘self’ do it too! From self-building to self-publishing, I say all a person needs is a bit of grit and determination and probably a deep need to be in control. You may be on the cusp of a ’self ‘project and I am here to say that it isn’t as scary as you think it is – help is at hand. I wouldn’t describe myself as a control freak (others might). Mr Clark says that I am fussy – I say that I am just a bit particular, but we both agree that if you want something done properly –do it yourself and for those things you can’t, pay someone else to do them (or if it is your sister, just ask nicely). You may not know anything about ground source heat pumps or where to put your punctuation after a bracket, but there will be someone who does. I think the best way to learn about something is from talking to an actual human being – as well as Googling of course. The internet does have its place in gathering essential information – how else would I know how to cook Jamie Oliver’s sticky ribs recipe or even how to recognise a sociopath? Homebuilding shows are brilliant for self-builders, not only for gleaning information from suppliers but from random conversations you may strike up with other self-builders as you eat your sandwiches. One such conversation gave me and Mr Clark the confidence to do it ourselves. (We also managed to get quite a good supply of free pens and sweets from the stands). This week we went to Bath Literature Festival and I went to seminar given by the lovely Flic Everett on ‘how to promote your self-published book’ (while Mr Clark went to see his e-bike friend and ate his way around the city). Not only did I come away with some extremely valuable nuggets of information but I met some really lovely people too, all like me on the quest to do it themselves. Mr Clark and I also visited the aptly named Topping and Co booksellers where I had the great fortune to meet and chat with a fabulous young lady who works in the shop and who gave me some very sound advice. 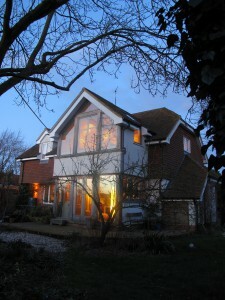 I’m not under any illusion that a ‘self’ project is easy – I’ve built a house – but it was a worth all the hard work and I still have a great sense of satisfaction, especially when I look back at the photos I’m submitting for magazine articles which document the build from start to finish. I’m still on my upward self-publishing trajectory – who knew what was involved without a publisher! As I get to grips with it, I must remember when I am checking my blog ‘stats’ (yet again) that getting out into the world and talking with people is paramount in enjoying the journey – and that is after all, in my eyes, what it is all about. 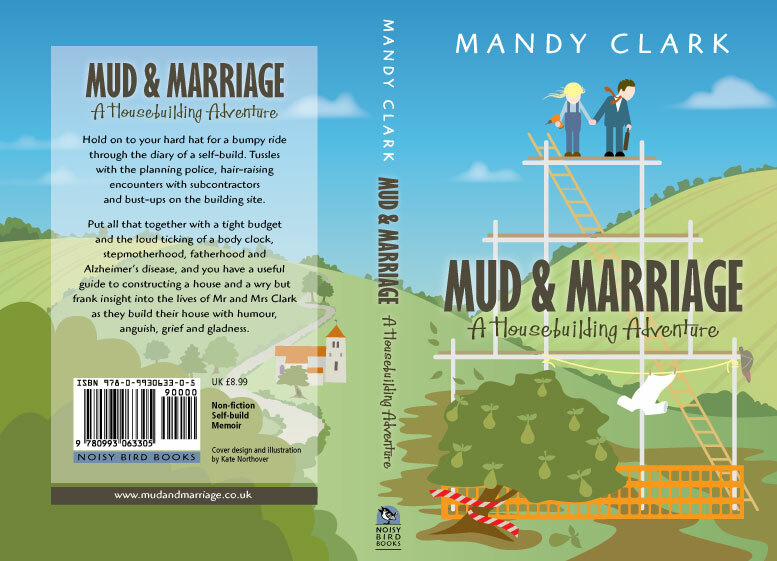 If you would like to know how you can build your own house there are some handy hints in my book Mud & Marriage – A Housebuilding Adventure, available from Amazon.co.uk (now available on Kindle) or from this website. This entry was posted in Book Updates, Self-Build, Uncategorised and tagged Bath, Bath Literature Festival, blog, building a house, control freak, conversation, Flic Everett, Google, ground source heat pumps, handy hints, help is at hand, Homebuilding shows, Jamie Oliver, self-build, self-publish, sticky ribs recipe, Topping and Co Booksellers on 6th March 2015 by Mandy Clark. 2… and… 1 – we have lift-off! 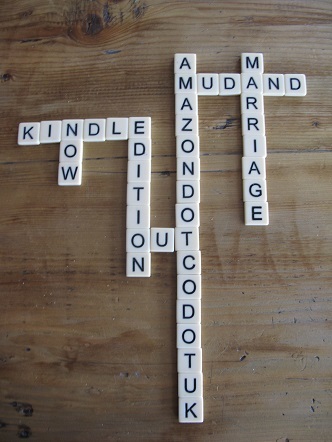 Thanks to my clever sister’s patience and hard work, the Kindle edition of Mud & Marriage is out now – phew! I have a slightly fuzzy head due to a few glasses of Prosecco to celebrate last night, but I am very happy indeed to be out electronically. You can now buy it from Amazon.co.uk. Valentine’s Day is here and lovely Mr Clark gave me some chocolates and I gave him some meat products (no,I wasn’t wearing them), so we’re both happy. We’ve just have just had a very challenging Bananagrams game, so Mr Clark has gone for a lie down as he has to be fit for his Deckchairs gig tonight at the Queens Arms in Reading – on the same bill as Peter and the Test Tube Babies. I will be going along (with earplugs, I want to try at least to save what is left of my hearing after having been in a loud band myself all those years ago). I’ll probably wear a badge that says ‘sorry I can’t hear you’ and take along a notebook. I remember taking a notebook out with me once when I had lost my voice. I made a heading saying ‘I have lost my voice’ and wrote what I wanted to say. It worked really well, but the strange thing was, people wrote back to me on the notepad rather than speaking to me – a bit odd, but effective. I still have the notepad from that evening and it makes interesting reading. It’s not that I don’t like the music, I do, especially the song that goes … ‘baby … have you ever been to Bracknell oo-a-oo-a-oo’, but I just don’t want to go mutton just yet. Mr Clark has been downloading sound effects onto pedals for the gig; I might miss the Charles Hawtrey one where he says gently ’ooh I do feel queer’ but I expect I will hear the scream, the siren and the explosion, as I don’t think even earplugs could keep them out. Right then – time to put my PVC trousers on. 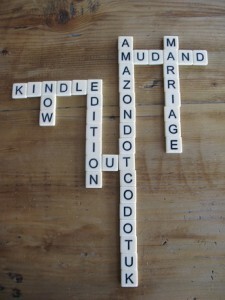 This entry was posted in Book Updates, Self-Build and tagged Bananagrams, Kindle, Notebooks, Prosecco, Punk, Valentine's Day on 14th February 2015 by Mandy Clark. Cockerels, cockerels everywhere! And not a shotgun in sight. When God invented cockerels he had probably just been to a Deckchairs gig without his earplugs. What was he thinking? Next door’s cockerel got killed by a dog. Then they went and got another one. Our neighbours over the road had so many cockerels at one point, they had to have a cull as the whole street was complaining. Heartless you may think, you live in the countryside and are very lucky so stop complaining you may say – what’s that? I can’t hear you I’ve got my earplugs in. Don’t get me started about pheasants. I wonder if you can actually build a soundproof house without breaking the bank. When we built ours we thought that all the insulation we put in the outer walls would be enough – naïve, that’s what we were. We put soundproofing plasterboard in between the bedrooms upstairs and that works really well in counteracting noise from snoring visitors, or Mr Clark cranking up his Marshall amp, but how I wish we had put it on all the walls. At the time it would have been a budget issue – it being pricier – and that would have made our spreadsheet of costs strain even more at its already bulging seams. If you are building a house on a tight budget you’ll know what I mean. I don’t know why, but I seem to have amassed a large number of egg boxes over the last couple of years. People always ask me why, as they are right by the front door steadily making their way up to the ceiling. I say that it is a modern art installation and balk when they ask if they can have a couple to take home with them. Maybe I’ll stick them to the walls of my bedroom for sound insulation. If you are building a house, even in the countryside, I would urge you to think about sound insulation. Isn’t hindsight a wonderful thing? My mum says it is. She says it teaches you to recognise the same mistakes when you make them again. If we do ever build again, you never know I might have collected enough egg boxes to actually put into the walls; now that would be recycling at its best. 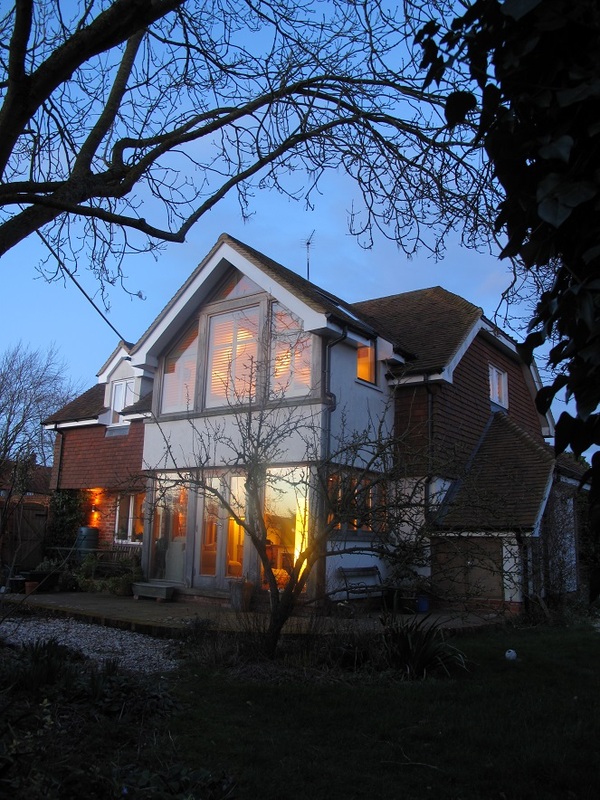 This entry was posted in Self-Build, Soundproofing, Uncategorised and tagged acoustic board, budget, cockerels, plasterboard, Soundproofing on 12th February 2015 by Mandy Clark. The bubbly is chilling in the fridge waiting for the launch of the Kindle version of Mud & Marriage, and will be popping its cork soon, as will I. My talented sis Kate Northover has been at it again (design-wise I mean) and has made a splendid job of getting the pages ready and putting them in the right order – who knew what was involved? So the countdown begins 10…9…8… ‘shping’- hold on a minute, that’ll be my phone. It’s my sister; she’s coming over so we can make some final adjustments to my ‘front matter’. I did get a Nokia Lumia 635 and am whizzing away nicely now thanks for asking. Apparently I can download an app on my phone to be able to read the Kindle book. 7…6…5…’ping’- that’s my phone again. My friend Sue has just put a picture of me on Facebook from the 1980s with very big hair; I look moody, I expect I was trying to look moody, although that is the trouble with my face – it either looks quite cross in repose or otherwise it looks as if I have done something really naughty, no expressions in-between. It’s a problem. Don’t be fooled by my online face, I had to try really hard to look normal. 4… Ah here’s my sister. We just have to tear Mr Clark away from Salvage Hunters long enough to give us a hand with some html code, and that might take a while. We’ll have to wait until he gets to an episode that he’s already seen. Mr Clark is an expert in code, especially at the moment as he has an ’orrible code in the dose, boom boom. (Yes, I know .. I know). Poor Mr Clark, all rugged up on the sofa, festooned in tissues with his mug of blackcurrant Lemsip. Blackcurrant Lemsip? Now that is a perplexing paradox or is it a misnomer? It could even be an oxymoron. 3… I’ll get the glasses out ready. Book cover design by Kate Northover. This entry was posted in Book Updates, Self-Build, Uncategorised and tagged bubbly. Nokia Lumia 635, Kindle, Lemsip, Salvage Hunters on 7th February 2015 by Mandy Clark. Should I get an iPhone? I’ve been putting it off. Whizzing touchscreens scare me. I had one a while ago but had to give it to my sister as I kept calling people by mistake. Mr Clark says that I am a Luddite and technophobe – charming. Things are moving on so quickly, I’ve been left behind and now I can’t be arsed to keep up. I went into the Vodafone shop in Reading recently for some help and the young chap serving me couldn’t be arsed to help me catch up either. He was drumming his fingers on the desk and looking around for something more interesting to look at. His attention was lost while I was confused about megabytes and why I would need so many of them – so what now? If it wasn’t for Mr Clark I would probably turn into Catweazle and go and live in a treehouse in the woods with my tellingbone. Mr Clark has now got a car camera which records his journey. Apparently it records sound too. I have been sticking my fingers up in front of it and saying outrageous things in case it gets played back. He pointed to the little screen and said to me ‘look, now you can see where you’re going’. If Mr Clark suddenly lost his memory, I would be stuffed. He deals with all the technical things like internet banking, error codes on the boiler and strange messages that pop up on my computer. I hope he doesn’t. Maybe I should build a treehouse just in case. Today I have been looking at the Vodafone website and wondering about the Nokia Lumia 635. That’s as far as it got, because then I couldn’t be arsed and wrote this instead. Now I’m going to sit somewhere nice and comfortable and read a book. 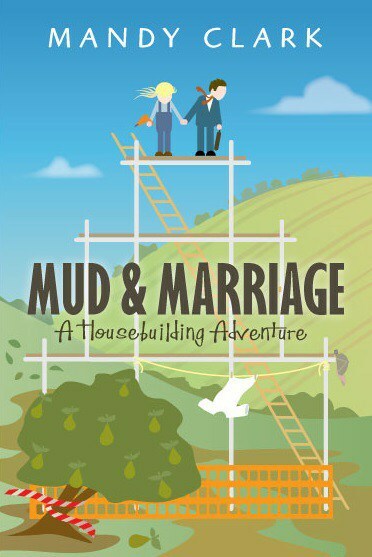 You won’t be surprised to learn that I haven’t yet bought a Kindle, but for those you have, the Kindle version of my book Mud and Marriage – A Housebuilding Adventure will be out soon on Amazon.co.uk – watch this space. Follow me on Facebook and Twitter for updates. This entry was posted in Book Updates, Self-Build, Uncategorised and tagged car camera, Catweazle, iPhones, Kindle, technophobe, Treehouse on 24th January 2015 by Mandy Clark. Get like-for-like quotes if you can. Always check the work somebody has done before they go, and get them to explain what they have done. Mark everything out exactly where you want it in case you aren’t on-site when the work is done. If you are a site manager, invest in some skiing salopettes from a charity shop for the winter, they keep out draughts and prevent builders’ bum. Don’t put a roll of lead behind your car seat and put the brakes on hard. 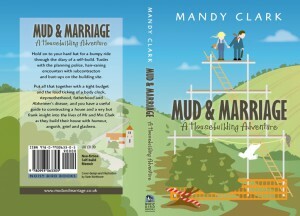 This entry was posted in Book Updates, Self-Build, Uncategorised and tagged self-build, Top tips for self-builders on 11th January 2015 by Mandy Clark. A pallet of wood pellets Mrs? Mr Clark says that he would like to build a carport/garage with a room above and a utility room joining to the house. Sadly I think he will need more than his wood work O level skills for the construction. We live in a narrow lane and some delivery drivers can back into the drive with some skill (even without taking out the fence across the way) if encouraged, but some flatly refuse to try. Some have terrible trouble getting our ton of pellets off the back of the lorry and onto the drive from the road; getting the load onto the tail lift is always a bit wobbly and precarious and has involved some very hairy moments where I thought I might get squashed like Wile E. Coyote flattened by a boulder. One driver got in such a bad mood with it all that he threatened to leave the delivery in the middle of the road – he didn’t luckily, but it was a close call. Another one had to call for backup from another driver as he really couldn’t manage. The other driver duly arrived. I don’t know if you’ve ever been in a situation where you don’t know if someone is a man or a woman but this was one of those occasions. It really didn’t matter and I don’t mean any disrespect, but these things bug me as I like to know what is what and who is who. He/she (who had beautiful nails) deftly manoeuvred the pallet of pellets into place and all was well. Then we let all the irate drivers go by… phew it is a strain sometimes. As a remedy for these shenanigans Mr Clark is thinking of getting an external hopper for the pellets and then they can be delivered by truck through a filling hose and that would be brilliant. It’s too late to build a self-feed to the boiler though, which is a shame. We’ve tried various makes of wood pellets, some make a load of dust and clog up the boiler, some are better. At the moment we have got Woodlets www.woodlets.co.uk and they are pretty good. Poor Mr Clark tripped over the hearth in his slippers the other evening and broke his fall by putting his hand on the glass of the lit boiler..Ooh I hear you wince, yes indeed. He has had bad blisters since but is on the mend. He had a gig with his band recently at the Purple Turtle in Reading and I made him wear huge bandages on his finger and thumb to protect them – very rock and roll – not. But he managed to play his guitar which was a relief. I steer very clear of the boiler these days, having warmed my behind a little too close the glass on one occasion and am particularly wary if I pass by wearing synthetics. Top tip* Never let your blisters burst. Use Aloe Vera and Lavender oil to heal up burns. This entry was posted in Self-Build, Uncategorised and tagged blisters, Oakcraft garages, Wood pellet boilers, Wood pellet hopper, wood pellets, Woodlets on 29th December 2014 by Mandy Clark. 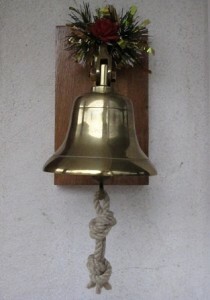 Is that the doorbell ringing? Glo oooooo – oooooo – oooooo r – ia, mince pies and Alka – Selzer! This entry was posted in Self-Build, Uncategorised and tagged Christmas, Doorbells, mince pies on 18th December 2014 by Mandy Clark.